For this exhibition Karen Love has selected sixty-seven 'infrequently-viewed" photographs from the collection of the Seattle Art Museum. Artists included in the exhibition are Berenice Abbott, Roy DeCarava, Walker Evans, Larry Fink, Robert Frank, Lee Friedlander, Jim Goldberg, Helen Levitt, Danny Lyon. Ralph Eugene Meatyard, Lisette Model and Garry Winogrand. 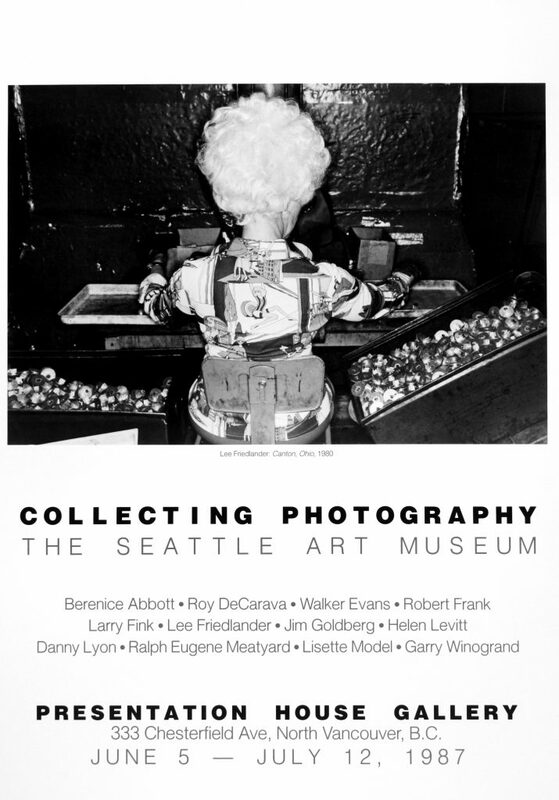 The exhibition is accompanied by a poster with an essay on the reverse - "Public Collecting: A Personal View" by Rod Slemmons, Associate Curator of Photography at the Seattle Art Museum, a exhibition list and acknowledgements by Karen Love. Supported by the Canada Council and the Leon & Thea Koerner Foundation, with assistance from Opus Framing Ltd.
Poster for the exhibition "Collecting Photography: The Seattle Art Museum"